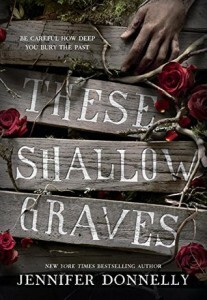 “These Shallow Graves” (Delacorte 2015) by Jennifer Donnelly set in New York City, 1890, is part Edith Wharton and part Charles Dickens and altogether young adult. Jo Montfort is the 17 year old daughter and only child of Charles, an aristocratic ship and newspaper owner, and Anna his wife. Jo is called home from boarding school when her father has a gun accident in his study at home in Gramercy Square. But is it an accident? Or suicide? Or something else? If word gets out, the scandal will destroy Jo’s chances of a brilliant marriage. So her Uncle Philip pays off the police to keep it quiet. Jo is somewhat ambivalent about the marriage prospect, but she’s grateful to Philip who is now the head of the household since the mourning period began. Jo aspires to be newspaper reporter like Nellie Bly—a woman!—who had gone undercover to write “Ten Days in a Madhouse,” bringing to light the brutality and neglect found in such institutions, in a successful attempt to improve the situation of the “insane.” Eventually Jo would be brought to an insane asylum in her own harrowing story. So the Edith Wharton part is, of course, the subject and setting of the privileged class at the turn of the twentieth century in the shadow of Gramercy Park. Dickens is represented in an Oliver Twist sort of underworld where a Faginesque character, known as the Tailor, pimps for child pickpockets including Nancy of the original, but in this story the Nancy character is the lovely Fay. When Jo delivers a gift to the family’s newspaper manager downtown, she meets the “cub” reporter, Eddie Gallagher. He’s SO handsome. And Irish. And streetwise. You can guess that there’s a brewing romance. But Jo agrees to marry the far more suitable and gentlemanly Bram Aldrich. But stuff happens. This is also a mystery and a thriller, and the early forensic information conveyed by the confident medical student, Oscar–is more than fascinating. Jo explains the complicated part of the mystery as she speculates and solves it. It’s, let’s say, surprising that she cannot guess the scandalous ship cargo in which her family’s shipping business is dealing. Well, she’s sheltered. But Eddie Gallagher, who’s working on the story with Jo can’t guess? Maybe the author feels that and a few other obvious clues are best solved by her YA readers, but I kind of think she’s underestimating her audience. Never mind. While working way too hard on my own writing all day, I couldn’t wait to get in bed and read ten pages of “Shallow Graves” but would usually end up reading about a hundred pages a night. Which is good because it’s nearly 500 pages long, but what a fun read! And it shouldn’t be limited to just young adults. Adults will love it.